The opening dates of two new major tourism projects – Dubai Frame and Jewel of the Creek – have been announced. 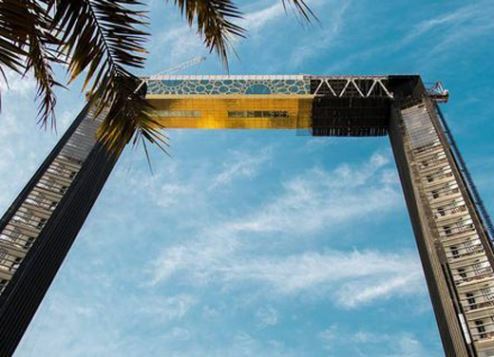 Dubai Frame, a picture-frame-shaped landmark, will open in Zabeel Park this October, according to the head of Dubai Municipality, Hussain Nasser Lootah. The 150-metre-high, 93-metre-wide structure is being built at a cost of around $44 million. A walkway runs across the top, providing visitors with panoramic views of Emirates Towers and the Burj Khalifa on one side, and of older parts of the city, such as Deira, Umm Harare and Karama, on the other. The interior space on the ground floor will be used as an exhibition gallery and museum, while a panoramic elevator will take visitors from the ground floor up through the rib of the frame to the top floor. Work is also well underway on the Jewel of the Creek project, which Dubai’s Roads and Transport Authority (RTA) has revealed will be completed in the first half of 2019. Comprising hotels, apartments, offices and a conference centre, the development, which is being built between Al Maktoum Bridge, Baniyas Road and the Floating Bridge, is expected to attract residents and visitors alike. The RTA recently awarded a contract to build the roads and tunnels leading to the project and at the same time, released its completion date. RTA director general Mattar Al Tayer described Jewel of the Creek as a “landmark tourist destination, adding further prominence to the city and the tourist profile of the area”.